This meal came about because I was too lazy to go grocery shopping after coming home from vacation, and had zero fresh food (but a lemon) in the house. I think I did pretty well for myself and was super sad that I didn’t have leftovers for lunch the next day. In a small bowl, combine everything but the broccoli and mix well. Add the broccoli (or whatever vegetables you want) for a rounded meal. This recipe is based off of a tuna chermoula toast I saw in a favorites of the week link roundup recently. I was struck by the simplicity of the flavors and the overall unexpectedness of encountering the humble canned tuna in presumably a party setting. Chermoula is a really neat condiment. Popular throughout northern Africa, this sauce is made a zillion different ways and used as a meat marinade, accompaniment to fish or seafood, and dressing for vegetables. 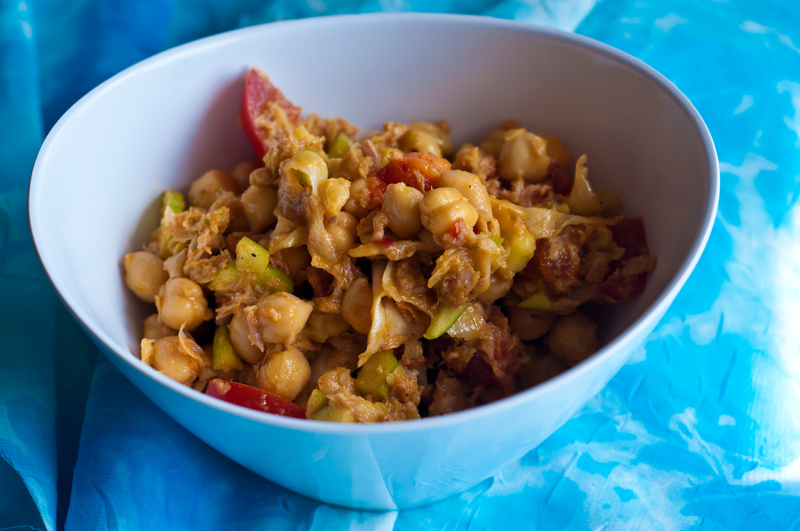 The version I’m making is seasoned to balance tuna’s meaty-but-dull nature. I’ve seen versions that include the brininess of olives, sweeter versions including raisins, and versions that just straight up seem like chimichurri to me. If you happen to have preserved lemons on hand, they would make a fantastic swap for the lemon here. I, sadly, have run out. If your broccoli isn’t already roasted, roast some broccoli florets sprinkled with salt, pepper and your favorite fat in a 400 degree (F) oven for 25 – 30 minutes). Let cool. Chop the cilantro, and add to a bowl. Add the lemon zest and juice, the garlic and ginger once those have been grated, the olive oil, paprika, cumin and red pepper flakes, and hit with a big pinch og salt and pepper. Taste. Your sauce should be nice and acidic and there should be a bunch of it. Adjust as necessary for your personal salt and heat preferences. Add the tuna and stir. Add the broccoli and stir. Chop the avocado and add last, gently stirring to combine. Taste again and adjust seasoning if necessary. 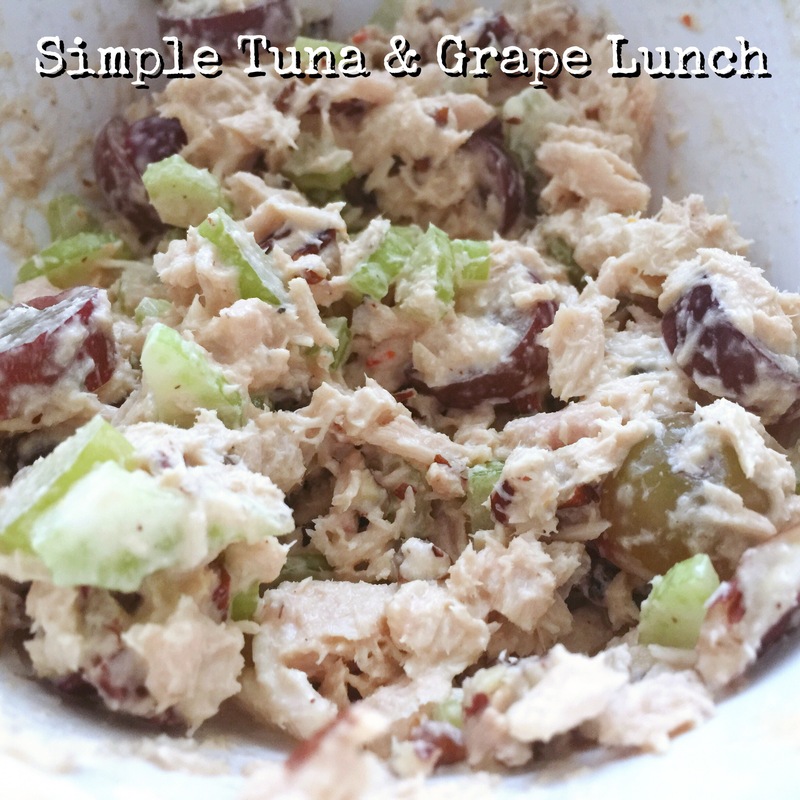 I had forgotten how quick, inexpensive and versatile a simple can of tuna was until I found myself without a good lunch protein and with zero desire to leave the house. Cue pantry staples FTW. I happen to love Jamie Oliver’s recipes – and am a big fan of his efforts to bring attention to what children are eating in school. He has one of my all-time favorite pasta recipes (a lovely confection involving homemade noodles, mascarpone & caramelized peppers) that my mind still wanders to when it conjures up a noodle craving. Some day, I’ll tackle a paleo-fied version! I also love how he thinks about ingredients and writes recipes – his site is one of my go-to sources when I’m feeling underwhelmed by the forces of inspiration. 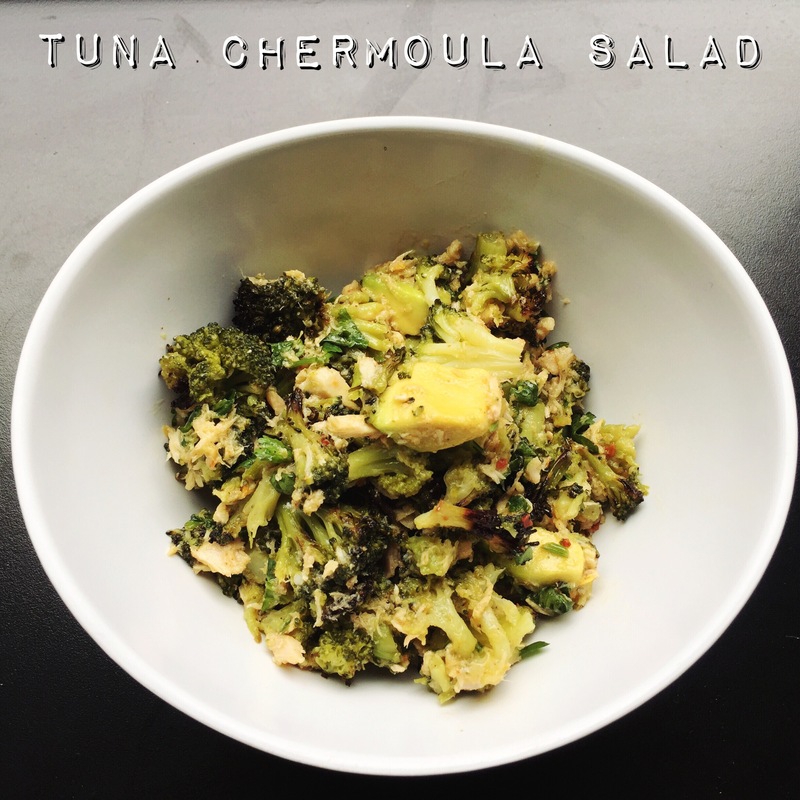 This recipe is based on one of his – it’s paleo-fied and uses more budget-friendly canned tuna (sacrilege!) in place of fresh, though I imagine this dish would be even better with the fresh. Dice the onion and garlic and add to a medium pan over medium/medium-high heat, along with 1 Tbsp. olive oil. Sautee the veggies until beginning to brown at the edges, stirring frequently to avoid burning. Add the oregano, tomatoes, salt, pepper and half a can of water and bring to a boil. Hard simmer/low boil 15 minutes, or until the water reduces out. Taste for salt/acid and add vinegar if needed. While the sauce is working, knock out the meatballs. First, chop your almonds fine – or blitz them in a food processor – or bash them in a mortar – or in a baggie – just get them into tiny pieces. Chiffonade the basil. Combine all meatball ingredients in a small-ish bowl and work with your fingers until combined. In a large pan over medium heat, bring 2 Tbsp. olive oil up to almost-shimmering. Add the meatballs as you form them into ping pong sized balls. You should get 6-7 meatballs of this size. If you want to serve more than 1 hungry person, consider doubling the meatball recipe. Fry the meatballs until browned, jiggling the pan around every few minutes to hit all sides. 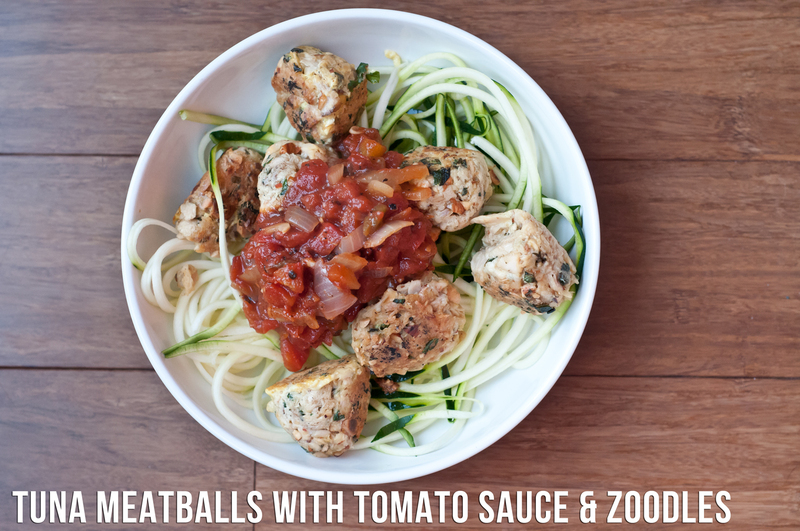 Make zoodles in the fashion you prefer while the meatballs are cooking. I used my bff the spiralizer and they came together in about a minute. If you like cooked zoodles, throw into the pan during the last minute or two of cooking – I happen to like them raw, so added mine directly to the bowl. Serve the zoodles topped with the meatballs and sauce – makes enough to serve 2 (zoodles and tomato sauce) – I ate all the meatballs myself and was happy with dinner. I imagine you could stretch the meatballs to feed two. This dish would be killer with the macadamia nut ricotta I made recently, too. 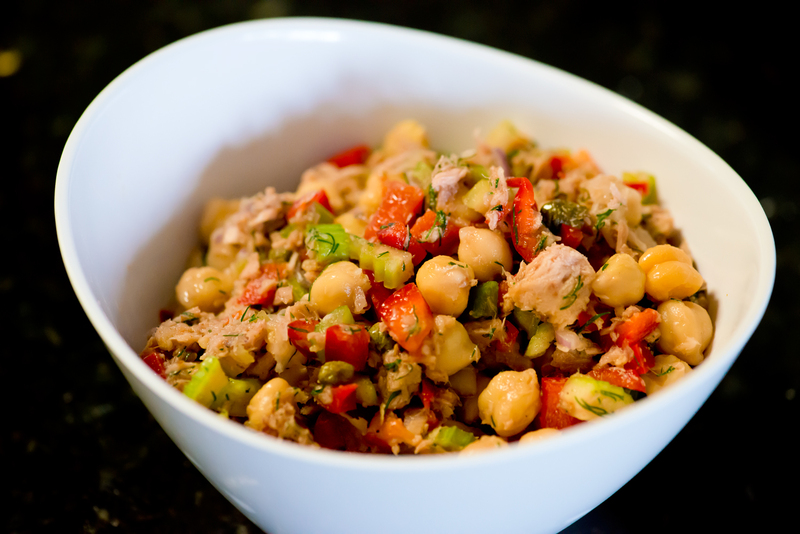 This light, bright tuna salad makes a great weeknight meal. Bold and flavorful – you won’t miss the calories. Prep all ingredients. Toss all ingredients together in a large bowl. Taste. Salt & pepper to your liking. Serves 2 + 1 for a light dinner & lunch. You can beef this salad up with some crusty bread or crackers, but it is perfectly satisfying without.